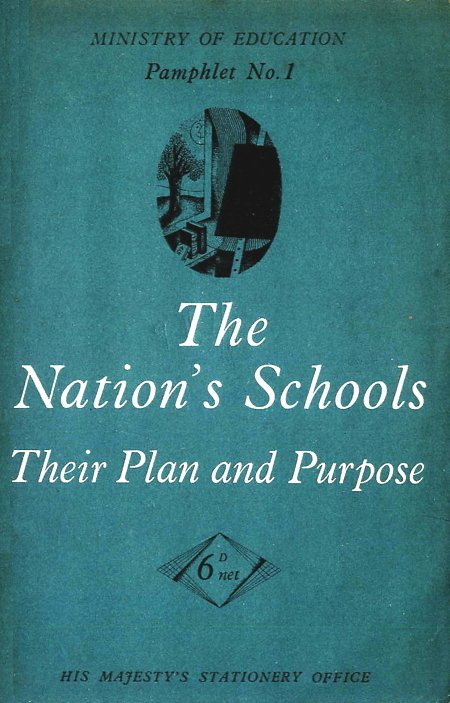 The Nation's Schools set out the arrangements for the 'tripartite' system of schools - grammar, technical and secondary modern - following the 1944 Education Act. Labour Party members were furious and Minister of Education Ellen Wilkinson withdrew the document. But as a result of intense pressure from education officials, the policy remained the same and was restated in The New Secondary Education (1947). The complete text of The Nation's Schools is shown in this single web page. The Nation's Schools was prepared for the web by Derek Gillard and uploaded on 30 January 2017. 1. FOR some two years past the energies and attention of the educational world have been largely devoted to the framing and passing of the Bill that has now become the Education Act, 1944. The Act represents only the framework of a reformed national system of education: it is essential to development and progress, but cannot of itself guarantee the freshness, imagination and vigour with which the life and work of the schools should be infused. 2. The development plan in its turn is a piece of administrative machinery: it will stand as the first working-drawing for the layout and build-up of the provision to be made for primary and secondary education. When completed - indeed, when it is carried into effect - there will still remain the major task - primarily the task of teachers, though administrators have their part to play - of ensuring that the schools so provided shall fulfil the high purpose indicated in the White Paper, "Educational Reconstruction", - " to secure for children a happier childhood and a better start in life". 3. The aim, if widely drawn, is clear; but to attain it will call for closer definition of ways, means and methods: we must now "write the vision and make it plain upon tables". Not, be it hoped, on tables of stone, fixed and immutable, for education is a living growth, and educational thought and educational provision, if alive, will grow and change. 4. It is the object of this pamphlet to set out some reflections relating planning to purpose in terms, not of the legal "child", but of living children. No attempt is made to discuss in detail the content of the education to be given, or the handling of the several subjects and activities of school curricula. To do so would be wholly inappropriate here and would demand a document of very different compass. * All that is offered is some consideration of the objectives of different types of education and the conditions necessary to their attainment. 5. Nor is any claim made of finality for any of the suggestions here discussed. It is the desire of the Minister that the central department should not hesitate to pool ideas with its partners in the education service simply because further experience may later lead to a modification of views once expressed. Change of views may be evidence of vitality, not vacillation. *Separate pamphlets will be issued from time to time dealing with particular aspects of school life or subjects of instruction. 6. We are not of course, planning a new educational edifice on a cleared site: the educational system exists. But the task before us is certainly not one just of repair and patching: it is rather one of extension and modernising to secure a new structure that, while incorporating all that is sound and serviceable in the old, will be fully adapted and fully equipped to meet the new needs of a post-war world. Such an undertaking will take time for its completion; and the adjustments and developments necessary will differ in different areas according to the resources already available in their existing provision. Inevitably, too, while the new structure is going up, many temporary expedients may have to be adopted to satisfy immediate requirements. 7. Thus the problems created by the new Act will vary from place to place and so will their solutions, and they will lead in time to new developments hitherto untried. The changes and the advances now to be made constitute a challenge to all, engaged in the education service to discover the best possible ways of giving effect to the intentions of the Act. There are no neat solutions of universal application to the problems that will arise; there is no panacea for our educational growing pains. Local initiative and experiment will be more than ever necessary if the Act is to fructify fully in all the different parts, with their varying conditions, of England and Wales. 8. Above all, ideas and experience must be put into a common stock for the assistance of the whole service. To that common stock it is hoped that the following pages may make some little contribution. 9. Primary education, as defined in the Act, covers the age-range from two to eleven or twelve, though attendance at school is not compulsory before the age of five. Within this range, the educational needs of children depend more on age than on any other consideration, and experience shows that these can best be met by schools which provide for a limited age-range and concentrate on the formulation and practice of techniques specially suited to it. 10. For this reason, primary education presents none of those problems of organisation due to doubts about differences of aim or content that confront us at the secondary stage. Already we know tolerably well what good primary education should be: three stages of growth and development are recognised in the primary period, represented by three types of school - nursery, infant and junior schools. These schools, as we now find them at their best, have proved sound instruments for their purpose. Though there will continue to be room for the exercise of initiative and imagination in the further development of method and technique, what is required in the main is a levelling up to the standards of the best in terms of accommodation, staffing and equipment, coupled with a general reduction, as soon as possible, in the size of classes. 11. Provision for the nursery age, two to five years, according to the needs of their areas, will, under the Act, become a duty of local education authorities, and form part of the national system. To assess needs, consideration must be given to the purpose or purposes which nursery schools are to fulfil. 12. Originally nursery schools were started as an antidote to unsatisfactory home conditions; to provide a suitable environment and proper care and training for little children whose home circumstances did not, and could not, provide them. These considerations will still apply; indeed, the need for nursery schools will remain acute while the housing shortage exists and while young married women are required in industry or continue to seek employment. Authorities will, therefore, need to determine in which districts it is most urgent to provide nursery education. The congested districts of large towns, and all areas built up with large blocks of flats or tenement housing, will clearly have a first claim, owing to their lack of the fresh air and space for free movement so necessary for young children. It must, of course, be recognised that the completion of the full nursery school programme for the country as a whole will take time, since the provision of schools for children of compulsory school age will demand urgent priority. 13. Few people would now contend that nursery schools exist solely to make good deficiencies in the home, and that they will cease to serve a purpose as new and better houses materialise and parents are better able to look after their children. The values of good nursery training are of much wider application. Given a good home and all that those words connote, the young child may no doubt find in the home environment much of what he requires in his early years. But few homes can provide all his needs, especially on the social side. The nursery school should be looked upon as an extension of the home, and the relationship of the school to the home is a vital one. 14. Good family life is the most stabilising influence in a child's up-bringing, and any external provision should help to preserve and, in some cases, to build up that family life. The nursery school sets out to do this by retaining many of the qualities of home, having close contact with the mother and sharing with her knowledge and understanding of the children, and enabling her to run her home with a greater degree of comfort and giving her the opportunity to live a fuller life. 15. The aim of the nursery school is threefold - to provide the medical care which such young children need; a training in good habits and right behaviour, and an environment in which they can learn the things appropriate to their age. Thus it provides a variety of play activities, manipulative, creative and imaginative, and opportunities for the activity required for a child's bodily development. Opportunities, too, are provided for the children to gain experience of the common properties of the things they see about them; to acquire skill and show enterprise in dealing with them, and to use language by talking to each other and to grown-up people. 16. By two years of age or so children have usually reached the stage at which they need companionship and experience beyond those which their mothers alone can provide. They are ready to spend a part of the day with a larger group in conditions which, while retaining many of the qualities of home, can provide experience of the give-and-take of life. At the same time the nursery group must be small enough for whoever is in charge to know each child as a separate personality and to give him the individual attention that he needs - to both his physical and mental growth and social adjustment. Margaret MacMillan said "Educate every child as if he were your own." 17. The size of the nursery school community affects, therefore, every aspect of a child's development. Little children are very susceptible to infectious diseases, and if brought together in large numbers the risk of infections is increased. Again, they find it difficult to develop a good social sense in a group which is too large, in which they become lost. This difficulty may express itself either in shyness and bewilderment, or alternatively, in aggressiveness, showing that the child's first step away from home has been made too hard for him. 18. All this points to the advantages of the small independent nursery school for, say, 40 children, 10 of whom might be under 3 years of age, with simple buildings in which, within certain limitations, the children are free to wander, and a garden in which they can play freely or enjoy the benefit of sleep in the open. With larger numbers the school inevitably becomes less homelike and there is a danger of losing sight of the individual child who, in turn, fails to find the secure and intimate atmosphere that the nursery school should give. 19. It may well be impracticable in some cases to adhere to such limits, but at least it should be recognised that the further the nursery school departs from them, the less effectively will it be able to discharge its true functions. The disadvantages of the larger school can to some extent be overcome as suggested by Margaret MacMillan in her book, "The Nursery School", by organising the children in separate groups of some 40 each, each group being a self-contained unit. 20. There is some opinion in favour of the small, independent nursery school retaining its children up to the age of 7 without admitting any children over the age of 5, and a few such schools have been established. Some further experiments on these lines will help to determine whether they do in fact assist or hamper the proper development of both groups, those under and those over 5. 21. The Education Act recognises nursery classes, attached to infant schools which admit children of 5, as an alternative form of nursery provision where independent nursery schools are judged inexpedient. Where it is agreed that the nursery class is the most appropriate provision very careful consideration must be given to the suitability of the accommodation, the staffing, and the arrangements for physical care. It is not contemplated that children under 3 should be admitted to nursery classes (as they have been during the war years). In general the conditions and arrangements of the nursery classes should be as similar as possible to those outlined above for the independent nursery school and the special needs of the under 5's must be safeguarded. 22. In rural areas the provision of nursery education will be less easy to secure. The problem cannot be solved simply by attaching children under 5 to the youngest class in the village school without any special arrangements for their care and welfare. Given sufficient room for children under 5, the appointment of a competent helper for a separate nursery group of, say, 10 or more children might do much to ensure that these young children shall have their own routine and activities, and shall not be obliged to remain still and quiet, in a state of unnatural repression, to avoid disturbance to the older ones. In some parts of the countryside, where there are several schools within a small area, it may be possible, when the distances permit, to convert one school into a nursery school, and the others into infant or junior schools. 23. For most children the infant school is their first introduction to school, though doubtless more and more children, as time goes on, will have first attended nursery schools or classes. Like the nursery, the infant school gives special attention to physical care and training in good habits, and, again like the nursery school, it must provide opportunities for the free play which is the very breath of life to little children. It must also give even fuller opportunities for the children to find, by their own experiments, solutions to the numerous problems which arise from their direct acquaintance with objects and the relations of these to one another. This will entail arranging not only individual work for the children, but also co-operative work for small groups, who can do things together with zest, freely talking together about what they are doing. It is only thus, by physical activity and by expressing themselves in language, that little children will learn to think in any real sense of the word, and that reading, writing and arithmetic will begin to appear as skills they would like to acquire and as something which they find of genuine interest. 24. The common practice in this country has been to separate the infant school both from the nursery and junior school wherever the number of children makes this reasonable. Doubts have, however, been expressed whether the first years of a child's school life should be subject to such frequent changes, and some people have advocated the combined nursery and infant school, and others the combined infant and junior school. There are also the experimental nursery schools to which reference has already been made which retain their children up to the age of 7 without admitting any children over the age of 5. These various groupings, though they present significant differences of outlook and practice, possess the common feature of providing for a wider age-range than separate nursery, infant and junior schools, thereby minimising changes of school. But it must not be overlooked that a period which seems short to the adult may be very long to the child and that between the ages of 2 and 8 children change and develop extremely rapidly, and that a change of environment may be a direct stimulus to development. however, the number of infants is not less than 80-100 a separate department may be regarded as advisable and justified. 26. There is the question, which arises only in urban areas, how big an infant school can be without being too big. Though children who have reached the age of 5 are not so easily bewildered by large numbers as those of nursery age, an infant school can easily be too large, and some undoubtedly exist which would be better split into two schools, or even three. It is here that most children learn to be self-reliant and independent, and they do so more easily in a school that is not overlarge. When several hundreds of young children are brought together in a large building they almost of necessity have to be marshalled and regimented. A total of some 200 is quite large enough for normal working, and 300 should seldom, if ever, be exceeded. 27. The development of reorganisation in recent years, concentrating as it has done very largely on better provision for the seniors, has diverted attention from the needs of the junior school. The juniors have, in fact, too often had to make do with the accommodation available after the seniors have been dealt with. But reorganisation should be to the advantage of juniors and seniors alike and the requirements of both should equally be kept in mind. 28. The aim of the junior school will be to make the fullest use of the lively interest of children at this stage in their own personal achievements and their active curiosity about the world around them; a curiosity and interest that can stimulate them to master, among other things, the elementary difficulties of reading, writing and arithmetic as they are required for dealing with simple everyday matters that concern them. For these reasons the curriculum must be thought of "in terms of activity and experience rather than of knowledge to be acquired and facts to be stored." This will entail continual departure from the traditional methods of class-instruction in favour of individual work in acquiring particular skills, and in project activities pursued in groups. Differences between child and child both in general ability and in specific aptitudes will begin to show themselves more clearly during this period, and the curriculum must provide for them. 29. In the junior school the children have already had their introduction to school life and are not yet divided, as at the secondary stage, over a variety of courses. The future scholar, the future technician, the potential artist, musician, craftsman or artisan, all are together in the same school, learning the same subjects and pursuing the same activities. Their capacities will be very various, and it is for the school to bring out the best from each. unimportant in determining the education he should receive. Children of this age have their special interests and characteristics, and they have a right to an education appropriate to these, irrespective of any claims made by a later stage of their schooling. 31. The truth of this is being increasingly recognised, and, as the present "special place" examinations are replaced by improved methods of determining for children the kind of secondary education best suited to their aptitudes and abilities, the junior schools will be enabled to develop an education at once wider and less formal than it has commonly been hitherto. More stress will be laid on promoting the physical well-being of the children, on developing their own interest in, and knowledge of, their environment, and on learning how to do things as well as learning from books. 32. In the largest junior schools children have generally been organised according to their ability in the "3R's", and in so far as this has made it possible to modify the pace in these subjects to suit the quicker or the slower children, the larger school has had an advantage over the smaller. It should, however, be borne in mind that grading on this basis may not in future appear so desirable as it does now, and that junior schools may not always be organised throughout in classes of approximately equal size: it would be a mistake, therefore, to relate size too closely to the possibility of grading the pupils according to their ability in the basic school subjects. A school of about 350 children will probably be found to be the largest size desirable for good normal working. 33. Special problems will arise in country schools. Many of these, though "all age" schools, are very small already, and with the transfer of the seniors to secondary schools will become smaller still. It is often difficult to decide on the best course to take with the children who are left. Wherever possible, it is undoubtedly best that young children, at any rate those below the age of 8, should attend schools near their homes. They cannot walk so far as older children and a bus-ride to school, even with proper supervision, is not a thing which all parents would welcome for children of this age. The best village schools for junior children have been very successful and have had a happy and intimate atmosphere which no one would wish to see lightly thrown away. Nor must it be forgotten that if it is an advantage to the child to have a school in the village, it is also an advantage to the village. sanitation and insufficient playground, which may entail rebuilding on a new site, authorities will wish to consider the arguments in favour of transporting even young children to other country schools offering adequate amenities. 35. These arguments are not based merely on economy. It is not always easy to staff the very small and remote school satisfactorily. Even if the teachers overcome the difficulty which they frequently experience, of finding suitable accommodation in or near the village, remoteness and all that it may entail are still deterrents to many. The concentration of children in larger units, not necessarily very large, often means a saving of staff, and the demands that have now to be met - the raising of the school-leaving age, and reduction in the size of classes - combined with the shortage of trained teachers will make it necessary to use the teacher force available to the best advantage. The development of rural transport has worked great changes in village life and in the villagers' attitude to making journeys. It is already a common thing, and it will become general in future, for the older children to travel to school, and where this is an established practice, parents are less opposed than formerly to the transport of even young children to school. Such concentration is not, however, desirable, and whenever it is reasonably possible these children should have their school close to their homes. At the same time the one-teacher school is also undesirable: the age-range of the pupils in such a school is usually too wide for one teacher to cover successfully, and if she should be off duty for any reason the children's interests suffer. "If ... the existing difference between the teaching methods in vogue in the two schools can be carefully shaded off, there is no reason based on psychology why promotion should not be made at about the age of seven instead of the later age of eight as some recent educationists have suggested." "Under these conditions" (i.e. careful correlation of methods) "there is no good reason why promotion from the infant school should not be made between the ages of seven and eight." result in too large an infant school, and in such cases the right course may be to make two junior schools. 38. The general transfer from primary to secondary education between the age of 11 and 12, now the almost universal practice, is confirmed by the definition of junior and senior pupil in Section 114 (1) of the Education Act, 1944. 39. Up to this point the path of the planner is comparatively straightforward: what is required in the primary field is to secure in sufficient numbers, and of a satisfactory quality, schools to provide education of three types - nursery, infant, junior - each type related to a definite age-range. Normally there is no question here of different kinds of education within the same age-range. The educational dietary provided at this stage, though demanding continued experiment, is broadly the same for all children belonging to the same age-group. 40. Very different is the prospect presented by the secondary field. Here there is a demand, and properly a demand, for a nicer adjustment of course or curriculum to the varying abilities and aptitudes, the wishes and the future requirements of the pupils. Even so, there will throughout be a common aim and some common elements - certain basic subjects taken in common - though these, more particularly in the later years, will be handled and presented differently in different cases. 41. The secondary stage exposes more acutely a root problem of educational organisation - how best to reconcile due regard to the individual with the necessity for dealing with him or her in groups - i.e. in classes or schools - a necessity due not to administrative convenience or considerations of economy, but to the fact that living and learning together is an essential element in education. As children grow up, the more widely are they found to differ in general ability and in their individual interests and aptitudes. It is, therefore, of first importance that there should be a sufficient choice of courses, and that within each school there should be variety in the subjects of the curriculum and in the methods of teaching. 42. Nevertheless, there will be a unity of purpose. Every secondary school will have the responsibility of training its pupils in body, mind and spirit. While reinforcing the earlier and more rudimentary training already received in intellectual exactitude and conscientiousness, it will introduce its pupils, according to their capacity, to wider fields of literature, music and art, and to the achievements of civilisation in politics, science and craftsmanship. One essential is training to speak and write the mother tongue clearly and well; to read it and listen to it with understanding. 43. By the time they leave school the boys and girls should feel some confidence in their growing powers and should have found enjoyment in some activity or branch of knowledge likely to be of permanent interest to them. They should know what it is to use their own initiative and what it is to co-operate with others for a common purpose: they should have acquired an appreciation of seemliness in both taste and conduct and that sense of self-respect which, whatever his work, impels the possessor to give to it the best that he has to give. With such training they will be prepared to play their part in the larger community of which they will later become responsible members. 44. The term "secondary", hitherto attached to a type of school, is by the new Act transferred to a stage of education. Whereas at the present time there are some half a million pupils in grant-aided "secondary" schools, all children from the age of 11+ are now to receive a secondary education, extending later to the age of 16. The figure of some half million pupils in "secondary" schools must be replaced in our thinking by some two-and-a-half to three million pupils receiving secondary education. 45. We have in fact a new genus of secondary education which has already developed a variety of species - different types of post-primary education, represented by the senior or modern school, the technical* school and the grammar school. These three broad types, now at very different stages of development, are intended to meet the differing needs of different pupils. These differing needs will still require to be satisfied, and it may be assumed that these broad types furnish the point of departure for further development. Indeed, it is only from "what is" that we can proceed to "what might be". The task to be tackled is to build up from these somewhat diverse elements a coherent system of secondary education; a task rendered none the easier by reason of the influences of established ideas and traditions and the antithesis so often falsely drawn between the terms vocational and non-vocational. 46. The first problem will then be to decide what provision should be made for each of these three broad types. It has been suggested that this can be determined by a percentage formula based on the normal distribution of different kinds of ability. Such a formula may be a useful general check or guide, but can hardly be of universal application. The conditions and requirements of different areas will vary, and planning on any too rigid or predetermined basis is open to objection. Secondary education in an area should be envisaged as a whole consisting of different types, the balance between which may be altered as the needs of pupils, the wishes of parents and local requirements become clearer in course of time. Fundamentally we have to select schools for children not children for schools. *This term covers schools of the kind now known as junior technical and junior commercial schools and junior art departments. case for increasing the present intake to secondary courses of the grammar school type. Indeed, it is reasonable to suggest that it might with advantage to many children be somewhat reduced, without prejudicing recruitment to the careers for which it gives the most suitable preparation. On the other hand, there is without any doubt ample scope for a very substantial increase in the provision made for secondary courses broadly described as technical. Even so, such provision will be far from covering the whole field or meeting the diversity of needs that have to be met. For a large majority of children the most suitable secondary education will be provided in modern schools. 48. The most urgent reform to which the development plan must be addressed is the completion of "Hadow" reorganisation. So long as all-age schools continue, it cannot be claimed that either the junior children in them are receiving an adequate primary education or that the senior children are receiving a proper secondary education. To raise the leaving age for them will be little more than a gesture. It may be that in some areas special interim expedients will have to be adopted for these children which will be superseded as the development plan matures, but in one way or another this problem must be faced and given the first call on our available resources. 49. We turn now to examine a little more closely the main types of secondary education as they now exist and as they may be developed. When the new county and municipal secondary schools came into being after the Education Act of 1902, they tended not unnaturally to adopt the traditional outlook of the older grammar schools, and were, indeed, in early days encouraged to do so by the regulations of the central department. They thus came to follow a curriculum related to university standards, and directed primarily to the service of Church and State and to the professions. Along these lines they have achieved remarkable success in establishing worthy traditions and sound standards of scholarship which it is essential to retain. No developments on other fronts must be allowed to obscure the country's need for men and women of learning, the foundations for which must be laid in the secondary schools. 50. But during the forty years of the development of these schools conditions have been changing. That the county and municipal secondary schools should have followed the grammar school tradition was not unreasonable when the conception of extending secondary education was to open up a way for the comparatively selected few to receive the education and training that would fit them for the professional and comparable walks in life. But the first small trickle soon became a considerable stream, with a rapid expansion of this type of educational provision to meet an ever-growing demand for an education believed to lead to what are regarded as the safer, cleaner and pleasanter jobs in life. In any case this was the only recognised secondary education available. 51. A new situation has thus been created, the full implications of which have hardly yet been generally appreciated. Whereas in 1913 the number of pupils in grant-aided secondary (grammar) schools was some 174,000, this number had in 1938 risen to 470,000, and is now estimated at about half a million. But, according to the last published statistics (1938), 40 per cent of the leavers from these schools had not taken the school certificate examination, which has been regarded as the normal test which reasonably intelligent children might be expected to pass who had pursued a secondary school education up to 16, and a considerable number (some 25 per cent) were actually withdrawn before reaching the age of 16. 52. From time to time steps have been taken to modify examination requirements and with them the curriculum, in an endeavour to secure that a larger proportion of the pupils should actually complete this secondary course. But only comparatively recently has the question been raised whether the issue does not lie further back, and whether this kind of education is in fact not that best adapted to the needs and capacities of an appreciable proportion of the pupils now receiving it. 53. There is a further point, too, that relates directly to the health and welfare of our national life. The education thus provided leads mainly to the clerical and black-coated occupations. It finds little natural outlet on the industrial side. Under the present system, the children who are judged to be the abler and brighter have been transferred to the secondary schools at the age of 11+. Their ability has thus been drawn very largely into professional, clerical and office occupations. Industry on the production and manufacturing side has to that extent been deprived of its reasonable share of the national talent - a loss which a country so highly industrialised as this cannot afford to carry. 54. Behind this development lie sociological factors - the fact that clerical as opposed to industrial employment is commonly held in higher esteem and is more eagerly sought by those who have a choice of their work in life. The reason is not solely a preference for the black-coat of the office over the boiler suit of the workshop. So far as young people themselves are concerned, particularly in these days of machinery, there is little doubt that many prefer, or would prefer, a practical walk in life. The "superiority", or supposed superiority, of the black-coated occupations rests no doubt in the main on the fears, deep-seated in the minds of parents, and not absent from the minds of the young people themselves, of the insecurity which in the past has so often been found attaching to industrial employment. In general, it would be true to say that in bad times the man at the bench is stood off more quickly than the man at the desk. their real aptitudes, and more closely related to the world in which they will be living. Having regard to the fact that already the existing schools provide a grammar school education for a considerable number of pupils who clearly cannot derive full benefit from it, it is reasonable to suggest that at present, taking the country as a whole, there is no occasion to extend this type of secondary education. 56. New buildings and extensions will doubtless be required to provide proper accommodation for many existing schools, or to meet movements of population: in some areas, too, the existing provision of this type may be insufficient, but in others it is already certainly excessive, and many children would benefit by being diverted in future to a different form of secondary course. At the same time it must not be forgotten that there may also be a number of children well suited for the grammar school course, who under present conditions, often for economic reasons, either do not transfer to it, or, if they do, are unable to continue in it or to complete it. 57. Apart from making good any actual deficiencies, where such exist, what is wanted in the main now is to secure that a larger proportion of the pupils shall derive the full benefit of the grammar school course by continuing their school life up to 18. The war has thrown into sharper relief our shortage of persons with higher qualifications, particularly in science, and from more than one quarter the view has been expressed that in future the requirements of this country will call for a substantial increase in the out-turn of those who have successfully completed courses, in wide variety, of university and comparable standard. There are signs, too, of an increased desire among the professions for recruits of greater maturity which the full course to 17 or 18 can secure. 58. The grammar schools can approach the future with a sense of solid achievement behind them and with an assurance that they still have a vital part to play. At the same time the provision of alternative courses of secondary education will offer the opportunity, and, indeed, impose the duty, of re-examining the distinctive aims and methods of the grammar school course which must be adapted to meet the dual problem of providing a coherent and unified programme of studies for pupils from the age of 11 to 18, and at the same time a course as reasonably complete as is possible for those pupils who will continue to leave at 16. 59. Although the term secondary has hitherto been attached to a particular type of school, other post-primary schools have been developing which are now to be given their due recognition in the secondary system and to take their place there alongside the grammar schools. These other schools at present fall into two main categories - the junior technical schools of various types, now well established but on a wholly insufficient scale, and the senior or modern school which is only now in the early stages of its development. There has been a substantial increase since then, but it is clear that there is a long distance still to travel before reaching that expansion of the more realistic and practical type of post-primary education which was recommended on educational grounds by the Spens Report on Secondary Education. 61. The typical junior technical school at present is that for boys, in which the education is related to future employment in the constructive trades - engineering and building. Over 15,000 boys were in these schools in 1938. The character and scope of these schools are often misunderstood: indeed, the schools are too little known. Where they exist they have gained the confidence of parents and employers, and have impressed the observer with the purposive vigour of the education they provide. Their freedom from the ties of any external examination has, no doubt, contributed to their vitality and successful development. 62. "Why then", it may be asked, "has an education of such quality not progressed further"? In the first place the normal age of recruitment has been 13 - a second creaming from the elementary school after the main transfer to secondary schools at 11+. The technical school has thus come to be regarded by many as something rather second-best - a school for the child who fails to secure admission to a grammar school. Secondly, there is the suspicion that still lingers in some quarters, that this kind of education has a vocational or pre-vocational element which means that it is not a truly sound and liberal secondary education. Lastly, in many instances the schools themselves have been accorded conditions of accommodation and other amenities which fall substantially below the standards looked for in the good grammar school. 63. Under the new Act these disabilities should disappear. Some missionary work will, however, be necessary, particularly among parents, to remove the misapprehensions that still persist as to the nature and scope of this type of secondary education. Nothing, of course, could be further from the truth than the idea that it is in any sense narrowly vocational. Its aim is not to produce little engineers or builders nicely adjusted to strict industrial requirements, but rather, through the interest created by a curriculum with a broad relation to future careers, to send out pupils equipped with a good general education that will stand them in good stead in whatever occupation they may enter, and will certainly enable them to embrace skilled employment with interest and competence. 64. The existing schools, largely related to the engineering and building industries, have shown what can be achieved by this type of secondary education: further development must be expected to cover a wider front and not to be confined to highly industrialised areas. Any industry which rests on a sufficient body of science and craft skill can serve as a focal point round which to build up the practical type of secondary education envisaged by the Spens Committee - "a liberal education with science and its applications as the core and inspiration". 65. Particular attention may be drawn to the needs of agriculture and agricultural engineering, which offer a wealth of material on which a suitable and lively course can be based. The new importance attaching to the maintenance of a highly skilled agriculture in this country emphasises the need to attract boys and girls to the agricultural life and to equip them to appreciate and to use the ever-increasing applications of scientific knowledge and method in this sphere. 66. Single schools may well centre their work on a particular industry, more especially if locally it absorbs a large number of recruits. In other cases it may be found possible to combine a variety of interests in the same school, to be pursued by different groups or streams. Nor must the needs of girls be forgotten: the field of employment for women in industry is rapidly widening and the possibilities of this more practical education in the case of girls have yet to be explored. 67. The trade schools, each of which has based its curriculum very largely on the technique of a single trade, are few in number. Within their terms of reference they have operated successfully, but they have suffered a serious disadvantage from their small size. For the most part they deal with very small numbers, ranging from as few as 15 or 20 to something under 100 pupils. Quite apart from inevitable difficulties of staffing, they cannot provide a genuine school life with the good companionship of a reasonable school community. Nor is it easy to reconcile the somewhat narrowly vocational objective at which they aim with the fuller content of a secondary education as it should be for pupils up to 16. The whole question of pre-employment vocational training needs, in fact, to be re-examined in relation to the new set-up of secondary education and the prospective requirements of industry. It seems likely that these schools will find their proper place in the educational system by raising the age of entry to the statutory leaving age, and adjusting the content and length of the course accordingly. absorb a considerably greater output. On no account, however, must the main purpose of such schools be regarded as the giving of a training primarily in shorthand and typewriting. The acquisition of these two skills must not be allowed in any way to dominate tile course, though introduced judiciously in the final years and closely linked with other subjects, they can in a good school give a healthy sense of purpose and precision to the whole curriculum. 69. The secondary education now provided in a number of junior art departments calls for some comment. There is no doubt that there are a number of children of marked artistic aptitude whose special interests may well form the basis of their education. In some areas, particularly where there are industries in which design is an important element, it may be found desirable to organise a school or schools in which the work is associated specifically with the arts and crafts. If, however, the numbers of pupils for whom such a course would be appropriate are likely to be limited, provision may be made for them more effectively as a group within a larger school unit. 70. The case for secondary (technical) education, and for its substantial expansion, does not rest simply on the success it achieves in preparing its pupils to enter on skilled employment with good prospects of advancement. It is true that the products of these schools have already proved a most valuable source of supply to industry and commerce, a supply which needs to be greatly increased if we are to maintain and carry forward our standard of skill in craftsmanship and of commercial efficiency. This form of secondary education, however, need not fear to stand on its own merits, irrespective of any such consideration, as an education broad and realistic, related specifically to the industrial and commercial environment of to-day. 71. There is good reason to think that there will be a number of pupils in these schools who would form a new and very valuable stream for further education and subsequently for posts of responsibility in industry. Possibilities of development in this direction should be carefully watched, and if the conditions are judged to be favourable, pupils should be encouraged to continue their full-time education up to the age of about 18, usually with a view to entry into a major technical college (or in some cases to a university), whether with or without an intervening period of industrial experience. This source of supply would do much to remedy the shortage of persons with higher qualifications in technology. handled by teachers with practical experience of industrial or commercial life. We are, however, in effect opening up a new field, the full possibilities of which must be learned by experience. 73. As with other forms of secondary education, the school unit devoted to education of the technical types must be of sufficient size to offer an adequate community life. In sparsely populated districts, the alternatives of boarding or of combination with other types of secondary course should be adopted rather than the formation of school groups which are too small to provide a genuine secondary education. 74. A word or two must be added on the question of accommodation. Many of the existing junior technical schools have been housed inside technical colleges and regarded as junior departments. With an age of entry at 11 instead of 13, and having regard to the increasing day-time demands on the technical colleges, it will be in the interests of both school and college to provide the school with its own premises, designed and adapted for secondary education, so that the special needs of adolescents can be fully met undisturbed by other considerations. At the same time association with the senior technical, commercial or art institutions should be maintained both through suitable interchange of staff, and by using wherever it is appropriate, the special equipment and facilities which the senior institutions possess. 75. We come now to the secondary (modern) school which will provide the secondary education of the majority of the nation's children. The best of the present senior or central schools point the way along which the secondary (modern) schools of the future will develop, and have, indeed, anticipated something of the scope and character these schools may be expected to achieve. But we are as yet only at the beginning; just as the senior and central schools constituted a surprising advance on the upper "standards" and "higher tops" of elementary schools out of which they grew, so the secondary (modern) schools with a higher leaving age, smaller forms and adequate accommodation, may be expected to develop far beyond the present senior schools. modern schools are to win general recognition as the secondary schools to which the majority of children will proceed, all these disadvantages must be removed as rapidly as possible. 77. The possibilities that the modern schools offer are generally too little understood and too little appreciated: they have their own contribution, and a vital contribution, to make to the development of secondary education. Free from the pressures of any external examination, these schools can work out the best and liveliest forms of secondary education suited to their pupils. It is essential that they should retain this invaluable freedom which the best of their predecessors have used to such advantage, and should be enabled to advance along the lines they themselves feel to be right. 78. It has to be remembered that in these schools will be a considerable number of children whose future employment will not demand any measure of technical skill or knowledge. As the mechanisation of industry increases, while there will still be an increasing need for the highest skills in the equipment and running of production and manufacture, there will be a growing field of routine and repetitive process work. This will present a definite educational problem. There are large numbers of persons who find in their work the mental stimulus and the creative satisfaction that they need, but there are, and will be, much larger numbers whose work may in itself offer little, if anything, to keep minds alert and interests alive. For these their education must provide the resources, and must develop within themselves the resources, to find and pursue interests which will add to the meaning and enjoyment of life. Yet the majority will later have home responsibilities which will demand a minimum knowledge of home skills and crafts, ability to plan ahead and to organise to meet family needs. The home-making aspect of education - often the basis of future happiness - is as vitally necessary as it can be interesting. 79. It has long been a principle of education in this country that the school should adapt itself to its surroundings, both in the aims which it has for its pupils and in the methods which it uses. The best senior schools have done this with great success. They have used their surroundings to make education alive and interesting, appealing to country boys and girls through their familiarity with nature and to town children through their own special interests. they should reflect the diversity of the countryside, while town schools may well take account of the industrial and social activities of the community. Local industries and local enterprise can often supply a quickening interest which country schools derive from the study of the countryside. 81. Craft work is not the only form of practical activity which the senior school has been developing. What is commonly known as the "project" has already proved its effectiveness in stimulating and maintaining interest in a way which the formal classroom lesson cannot emulate. Through local surveys, for instance, children discover for themselves something of the history, geography and social structure of their own localities and learn to see themselves in the setting of a community wider than the school. 82. Side by side with these practical activities, will go the more formal classroom studies, the standards of which cannot be neglected or allowed to fall. Experience goes to show that in fact the practical work so stimulates the interest of pupils and can be so related to the more formal studies as to raise the standard of attainment. Many a child makes better progress with arithmetic when he finds that it is useful, and, indeed, necessary, to enable him to keep the gardening accounts or the accounts of the livestock club. Increasing numbers of teachers are discovering material for instruction in English, history, geography and science not as formerly only in what the children read but in what they do. 83. The secondary (modern) school should, like other secondary schools, develop its own community life, through out-of-school activities, such as the old boys' and old girls' club, dramatic and musical societies, photographic, gardening or swimming clubs. It will be one of the main pillars in the secondary structure, aiming at giving a full school life and a balanced education that is at once practical and general, which will equip a large number of the country's future citizens to enter the larger world trained in character, adaptable and awake to the possibilities that lie within themselves of finding and pursuing interests both of mind and hand that will aid their further development and add to their pleasure in life. proper school life, there is room for judicious experiment elsewhere before we can feel any confidence that we know what is best for the children. 85. The extreme measure of combination is that commonly referred to as the multilateral school, which would provide in one unit for a given area all the secondary education of all three types. There are obvious attractions in such an organisation. It avoids the problem of selecting schools for children at the age of 11, and offers the great social advantage of bringing together children of different types, thus providing a common background for them in later life when they will be occupying different positions. It may, too, be urged that only by bringing all forms of secondary education under one roof can the unity of the secondary system be ensured. 86. These are points that cannot be disregarded, but there are other considerations that must be borne in mind. "Parity of esteem", which is a major objective that the multilateral organisation is designed to attain, will depend more on changes in accepted social values and on change of outlook among educationalists themselves. We have moved a long way from the situation in which Huxley complained that the scientists "were ex-communicated by the classical scholars in their capacity of Levites in charge of the Ark of Culture and monopolists of liberal education." But we have still to reach the position in which the value of an education is judged not so much by its actual content as by the degree to which it succeeds in making the most of the individual. Until that is recognised, different types of education, whether taken in one and the same school or in separate schools, will continue to be held in varying regard. The problem of selection cannot in fact be avoided; it must be faced; and is not necessarily easier to solve within one school than between three schools. 87. A school of this type must be very large if it is to provide effectively the full variety of courses it is intended to cover. It is a tradition in this country to keep our schools more intimate communities, and although we must not be bound by tradition, there is every reason to believe that in this instance it holds values not lightly to be abandoned. Nor is the point without substance that, experience in leadership in the common life of the school, which should be a valuable element at the end of the secondary course, would tend to be confined to those few in such a school who stay till 18. 88. Again, although all forms of secondary education have a common aim and purpose, the different forms have each their own specific aim as well. In the all-embracing school it will not be easy to preserve due balance between these specific aims, and the claims of different interests or sections may not secure equality of consideration. Past experience suggests that schools with a limited and well-defined aim are the most likely to succeed in reaching and maintaining the highest standards within the particular field they serve. 89. There are also certain practical considerations. We have to work into our planning our existing plant, and this in itself limits in some degree the extent to which new groupings and combinations are possible. Moreover, the acquisition in cities of sites suitable for very large schools will present formidable difficulties. While enterprise and experiment are certainly to be encouraged, it would be a mistake to plunge too hastily on a large scale into a revolutionary change which would entail some losses that are clear and offers gains the values of which for this country are perhaps somewhat uncertain. Innovation is not necessarily reform. 90. What has been said above refers to the school as a unit under a single Head, and it may be added that, when opportunity offers, there is much to be said for bringing together separate schools of different types on the same site, or in close juxtaposition. It would then be possible to secure exchanges of staff, and to provide opportunities for the intermingling of pupils through a variety of joint activities. 91. A secondary school must not be too small to offer alternative courses to pupils of differing needs, nor too restricted as a community. An annual enrolment of at least two forms is the desirable minimum. An annual entry of three forms permits of good classification and reasonable alternative courses, and should normally be regarded as large enough for schools organised on existing lines. Bigger numbers will be found necessary for schools of multilateral type, and the problems of organisation will call for careful consideration. 92. It is now not merely within a local authority's power but its duty to consider whether boarding arrangements are desirable for certain children. County authorities, with thinly populated areas, and others who have exceptional children to provide for, will be enabled by section 8 (2) (d) of the Act to make suitable arrangements for special forms of education. The Act does not refer only to boarding schools; some authorities are a ready boarding-out children from remote districts, even those of primary school age, in private families and it is probable that these arrangements will become more general. parents are serving or working abroad and have no settled home in this country will have a special claim to boarding facilities. 94. Nor should the educational benefits of boarding be overlooked. For example, those interested in sea training will find a nautical boarding school makes considerable appeal owing to the better opportunities for practical sea-going activities, for a service discipline with all that it implies and for the training in communal living which is so important for a boy who intends to go to sea. Or again, pupils with a desire to take up agriculture will look for realistic conditions, which are more feasible in a boarding school with a farm attached where the school day need not be restricted to a 9 to 4.30 period, but can be modified to suit seasonal requirements. 95. Boarding arrangements as a means of giving town children an acquaintanceship with country life should also be considered. A period of residence in a school camp or other boarding school in the country would contribute substantially to the health and width of outlook of any child from a town school, especially if the care of livestock, the growing of crops, the study of the countryside and the pursuit of other outdoor activities formed the bulk of the educational provision, and were handled by specially qualified staff. Apart from schools or camps specially established for such purposes alone, authorities might well explore the possibility of making arrangements for taking in such temporary boarders at existing boarding schools, either their own or some other authority's. In some such ways valuable experience gained under conditions of war can be carried over and adapted to peace-time conditions. 96. Nothing has yet been said on the question whether separate secondary schools for boys and for girls, or schools which are mixed, are to be preferred. On a question of this kind it is neither possible nor desirable to lay down a fixed doctrine. Both types of school offer certain advantages and certain disadvantages. Generally speaking, it is desirable and advantageous for boys and girls - and men and women - to be educated side by side, and to learn to know and respect each other's point of view. In the fields of primary and further education co-education is to be preferred. It is in the secondary field that the rival advantages of separation make themselves most apparent. At this stage boys and girls must be separated for physical training and major games, and there are other respects, too, in which their needs and interests will run rather apart. those of the other. Where separate schools are provided, there will be clear advantages in placing them side by side or in close proximity so as to make possible joint activities and the pursuit of common interests. 98. The age of entry to all types of secondary school will normally be between, the ages of 11 and 12, though it is possible that for certain types of school, principally boarding schools and for a time yet, in some districts, existing secondary technical schools, 13 may prove to be a more convenient age. Provision will in any case have to be made for transfer at about 13, or even later, of pupils from one form of secondary education to another when it appears that their needs may thus be better met. There are great advantages for a child if he can spend his secondary school life at a single school and avoid a break at 13, and administrative convenience should not lead to a break at 13 becoming the rule for the generality of pupils; nor should the difficulty of determining for some of them, at the age of 11, what form of secondary education is most suitable, lead to the establishment of schools with an age range of two years, for pupils of 11 and 12 only. Schools with such a short age-range would be in the nature of clearing houses, and could scarcely solve, though they might obscure, the problem of finding the right curriculum for particular pupils of this age. 99. The selection of the right type of secondary education for the individual child must be regarded as a process that will take time, and the time will vary with the child concerned and the methods employed. The process will begin in the primary (junior) school and will be continued actively in the early stages of the secondary course. Watch must be kept for the appearance of special aptitudes and marked abilities, though consideration must also be given to any strong inclinations of the pupil or the expressed wishes of his parents. 100. Methods of selection have not yet been so perfected that it is possible in any way to dogmatise about the best means to employ: those used in the past have often been criticised on the ground that they led to cramming and special coaching; distorted the curriculum in the junior schools, and were unreliable. Further research and experiment are very necessary, but it seems certain that in the meantime no authority can afford to neglect any of the following methods - careful records of the pupil's progress, interests and aptitudes; general objective tests of intelligence and aptitude used, if possible, more than once during the child's primary school years; enquiry into discrepancies between performance in these and school progress and comparison with performance in other tests. These records and tests should make possible a fair assessment of the child's capacity so far as it has developed by the end of the junior school course. the line of education most suited to individual children. This is a task which may well be put in hand now. It will be necessary, for example, for teachers to have knowledge of the kinds of secondary education available in the area, of the demands which each makes upon the pupil, and of the careers which each opens up. While plans are still being made, much preliminary work of great value might be done along these lines by discussions between teachers from primary and secondary schools and others concerned in the work of selection. In particular, those from the primary schools should see for themselves the various forms of secondary education and the particular qualities which they demand. If experience of this kind is gained before the actual emergence of secondary education on its new lines, its ultimate growth and success will be all the surer. 102. Unless the further reviews within the secondary schools are general and thorough, many pupils will pursue courses of study unsuited to them, and injustice will be done to both them and the schools. To persuade parents that transfers are to their children's advantage will often be a difficult task for local authorities or heads, but this responsibility cannot be shirked if full justice is to be done to all. Greater weight than in the past will thus be attached to the teacher's judgment, in both primary and secondary schools, and to the record of the individual pupil, and the need for external examinations of the conventional type, in English and arithmetic, may be expected to diminish progressively as teachers become more skilled in the work of assessing and recording. 103. In all secondary schools, whatever types of courses they offer, the main emphasis during the first 2 years will be on general education. There should, therefore, be no great difficulty in making late transfers, such as are advocated here; they are already an accepted procedure in many areas. The main difficulty has arisen in the past from the fact that many pupils transferred to grammar schools later than at 11, from other types of school, had not yet started a foreign language. But not all the languages studied in the grammar school course are begun at the age of 11, and late entrants who have not begun a foreign language could either begin the language which others begin at their age, or have special arrangements made for them. This difficulty, which may arise with other subjects, such as science, is not, in any case, serious enough to invalidate the principle that there must be free transfer between all three types of secondary education during the first two years. 104. It is now a duty of local education authorities to provide special educational treatment for children suffering from any disability of mind or body. The duties imposed by the Act of 1921 related to special schools only, but those imposed by the Act of 1944 include also special treatment in ordinary primary and secondary schools and in institutions which are not schools. 105. The aim of special educational treatment is to provide for each handicapped child an education that is adapted to his needs - needs that, because of his disability, are somewhat different even from the diversity of needs of children who have no handicap. His needs may be (a) a specialised form of instruction, e.g. for a blind child who cannot read the books normally in use; or (b) a special environment in which ordinary methods can be used, e.g. for the delicate, an open-air regime with closer medical supervision but ordinary teaching methods; or (c) a different content and pace of education suited to a different mental outlook; for example educationally subnormal children require a curriculum suited to children whose background of experience and insight into relationships are restricted; or (d) the services of a specialist not found on normal school staffs, e.g. a psychologist or speech therapist. 106. Besides aiming at the ordinary goals of education, the teacher giving special educational treatment must also have in mind the rehabilitation of a child suffering from a handicap, either temporary, or possibly lifelong, which to some extent marks him out from his fellows. It must, therefore, be the design of any system for providing special educational treatment to enable the teacher as fully as possible to perform this additional task, which will involve appreciating peculiarities in the child's outlook. To this end it is better to remove some children entirely from the environment of an ordinary school in which they are too conspicuous, and to educate them in a special school; but others, the majority, are better retained in the group of children in which they are found, and educated to form members of that group. Hence the new Act recognises that special educational treatment may be given in ordinary schools where the child would benefit more from this than from education in a special school. general less than five class groups. It has usually been found unwise to establish a special school for educationally subnormal children on the same site as another school. In making their plans local authorities should consider how far neighbouring authorities or voluntary bodies can help them to make suitable provision. 108. Delicate children should be provided for in day open-air schools or boarding schools of recovery, but where the primary or secondary schools of an area are of modern type, and where meals are provided, many delicate children can with benefit to themselves attend these instead if they have the necessary medical attention, and a period of rest after dinner. 109. The methods of education needed by the other types of handicapped children for whom special educational treatment must be provided - the partially sighted or partially deaf, those with speech defects, the educationally subnormal, and the maladjusted - do not differ so widely from those used with normal children, and special treatment often can and should be given in primary or secondary schools; pupils, however, who fail to make satisfactory progress in this way will need special schools. Thus partially sighted children may remain in ordinary schools if provided with special equipment and teaching, or they may attend a special class in an ordinary school. If, however, their disability is serious they may have to attend a boarding school for partially sighted children; it is seldom possible to have a special day school for them, and it is not desirable for them to attend schools for the blind, except as a temporary measure until boarding schools for the partially sighted are provided. 110. Partially deaf children may be divided into two groups; those who can be taught with normal children if they have instruction in lip-reading and individual aids to hearing, and those who, even with these aids, cannot. The latter should go to schools for the deaf or the partially deaf; the others will need instruction in lip-reading by a specialist, and to be provided with hearing aids when necessary. Authorities should arrange to provide expert advice and guidance for teachers who have these children in their classes. Until these children have learnt lip-reading it may be necessary to send them for a short time to schools for the partially deaf. 111. Children suffering from speech defects, other than aphasia, should be retained in their own primary or secondary schools and should be given treatment by a qualified speech therapist, either at their schools or in a clinic. primary or secondary schools, either by establishing special classes or sections of classes for them or by giving them special instruction in the subjects in which they are specially backward. A child, however, whose disability is serious will require a special day or boarding school. In the more populous areas it will be possible to establish day special schools and one of these schools should certainly be established where there are 10,000 children of school age within reach; mixed schools taking children of all ages should have at least five classes. Authorities who find a day school impracticable should consider the establishment of boarding schools, either for their own area or in conjunction with neighbouring authorities; it is estimated that two boarding school places will be needed for every 1,000 school children, even where there are day special schools. 113. Children found to be suffering from educational, personal, or social maladjustment should be referred to a psychologist or child guidance centre or clinic, which will advise on the special educational treatment required. This may include treatment by the psychologist, or at the clinic, and also appropriate handling of the child's difficulties by his teacher in the course of his school work. The authority's arrangements should include the training of their teachers to enable them to carry out this work. A few children, because of the seriousness of their maladjustment, or the fact that it cannot be remedied at home, may need to be sent to a boarding school for maladjusted children, and authorities should arrange, either singly or in conjunction with each other or with voluntary bodies, to provide boarding places for these children. Such schools should normally be small and home-like, and the limited experience so far available suggests that they should not take more than 25 to 30 children. It is usually better to provide education for them on the premises, but the provision of a boarding home near a suitable primary or secondary school is not ruled out. 114. At the beginning of the White Paper "Educational Reconstruction" were quoted the words spoken just over 70 years ago in the House of Commons - "Upon the education of the people of this country the fate of this country depends." There in a sentence is the measure of the responsibility that rests upon the education service. The courage and imagination with which the development plan is drawn, the energy and judgment with which it is carried into effect, will not only determine the future growth of our educational system, but may largely shape the future course of the nation's forward march.